Snow that began Sunday night continued into Monday and made for some slick roads for the morning commute. Areas of northern Connecticut saw two to three inches of snow before the sun came up. State police responded to some minor crashes and spin outs on state highways but none were serious. Schools were off across Connecticut for the Presidents Day holiday, cutting down on the amount of traffic on the roads and sparing superintendents from having to make a decision about delaying or canceling school for the day. Some parts of the state saw the snow mix with sleet, keeping totals down to just one inch or so. Snow showers were expected to continue through the afternoon and some spots could see an additional one to two inches of snow before the system moves out of the state. Tuesday is expected to be clear and cold but another system is headed our way for Wednesday. 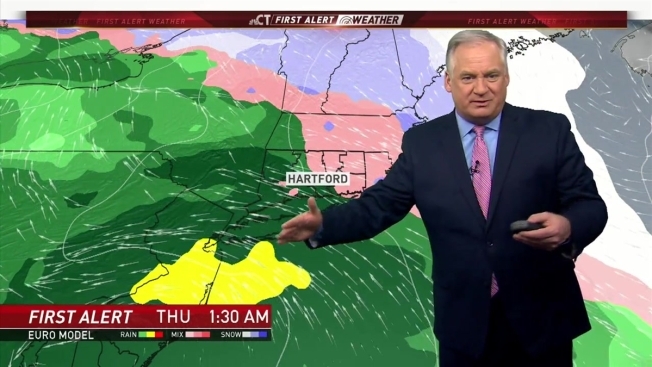 The NBC Connecticut meteorologists have issued a First Alert for snow beginning Wednesday evening that could be briefly heavy at times before the precipitation turns over to rain on Thursday morning.